Advanced Micro Devices hopes to provide thin-and-light laptops that are less expensive but equally speedy to Intel's ultrabooks with its new A-series chips, which the company officially announced on Tuesday. The A-series chips, code-named Trinity, will enable laptops to be made that are comparable in size, weight and battery life to Intel's ultrabooks, said John Taylor, director of global product marketing at AMD. Users won't have to pay "premium prices" for Trinity ultrathin laptops, which will be significantly cheaper than Intel's ultrabooks. Laptops with Trinity chips will be priced at "mainstream prices," and offer battery life of up to nine hours, Taylor said. AMD has said that Trinity laptops could start at US$500, while Intel's ultrabooks starting prices of $750 to $800. Intel hopes to bring that down to $699 by the year end. Laptops with Trinity chips will offer around eight hours of battery life, Taylor said. The chips will go into laptops up to 22 millimeters thick, just a hair over the 21-mm maximum set by Intel for ultrabooks, AMD's Taylor said. The chips will draw around 17 watts of power, similar to the upcoming Intel's Ivy Bridge ultrabook chips. AMD will also provide quad-core Trinity chips for ultrathins, Taylor said. Intel has said ultrabooks for now would be limited to dual-core processors, but quad-core chips could give AMD-based laptops a performance advantage. "We have differing approaches [to Intel]," Taylor said. "You will see a spread of price points and configurations that will create more lower price points for consumers to jump in." The A-series chips will initially appear in systems from five PC makers, with hundreds of designs in the works, Taylor said. Hewlett-Packard last week introduced thin-and-light Envy Sleekbook laptops with options including AMD's latest A-series chips starting at $599. That is $150 cheaper than HP's new Envy ultrabooks, which have Intel processors and start at $749.99. HP said that Envy ultrabooks and Sleekbooks offer similar battery life of eight to nine hours. HP also said that while Sleekbooks with AMD were strong on graphics, the Intel ultrabooks were slightly thinner and lighter, offer better resume time from standby and also have antitheft features. 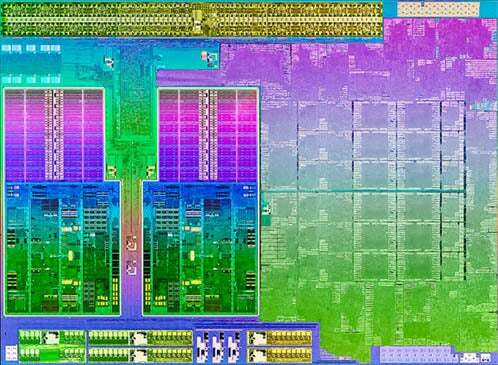 AMD's Trinity chips come a month ahead of Intel's launch of third-generation Core chips for ultrabooks, code-named Ivy Bridge. Intel is pouring $300 million into the development of ultrabooks, which will have tablet-like features such as instant boot, touchscreens and all-day connectivity. AMD said Trinity-based laptops will ultimately have features like touchscreens and high-resolution screens. PC makers want to offer laptops at every price point, and designs are tweaked to get the smallest size and best battery life, said Dean McCarron, analyst at Mercury Research. AMD's calling card in the past has been lower pricing. AMD excels on graphics, but there are questions about whether the company's chips can match Intel on power efficiency, McCarron said. AMD's Trinity chips are a manufacturing generation behind Intel, whose upcoming ultrabook chips will have 3D transistors and will be made using the 22-nanometer process. The new chips replaces the current line A-series line of processors code-named Llano announced in June last year. AMD has improved the CPU, which is 25 percent faster than comparable Llano chips, and graphics core, which is 50 percent faster. The Trinity chips have a new CPU core code-named Piledriver, which succeeds the previous Bulldozer core used on the high-end FX desktop and Opteron server chips. The first Trinity chips include low-power chips that could go into thin and low-power laptops. The dual-core A6-4455M chip runs at a clock speed of 2.6GHz and draws 17 watts of power, while the quad-core A10-4655M chip runs at 2.8GHz and draws 25 watts. The company also announced three 35-watt A-series chips. Desktops and all-in-ones with Trinity chips will come next month, Taylor said. PCs with the new chips are ready for Windows 8 -- for example the Metro user interface is offloaded to the graphics processor, leaving the CPU free to take on additional tasks. The Trinity release comes as AMD rebuilds its product portfolio and restructures its business model. The company appointed former Lenovo executive Rory Read as CEO in August last year, and new chief technology officer Mark Papermaster was appointed in October. The management changes didn't alter the Trinity chip design, Taylor said. Going forward, the company is trying to maintain chip flexibility so it can include third-party intellectual property, in line with a change in chip design methodology set forth by the company on analyst day in February.